Soak dried corn husks in a large bowl filled with hot water. Place a heavy pot on top of the corn husks to submerge and soak them for at least one hour prior to using them. Once pliable, rinse each corn husk under running water to remove debris. 2. In a large bowl, mix the masa harina, baking powder, and sea salt together, then add the warm vegetable broth to the flour mixture. Mix in the broth using your hands to incorporate the broth into the flour to make a firm dough. In a mixer, cream the butter and shortening until fluffy, then add the masa dough little by little into the mixer until well mixed. Continue mixing the masa at a low-medium speed for about 5 minutes, scraping the masa off the sides of the bowl during mixing. Set masa aside while preparing the filling. In a large skillet, at medium heat, add the olive oil and sauté the red onion and garlic until translucent. Next, add the squash and mix with the onion and garlic for about one minute. Then add the tomato, dried oregano, and sea salt, and continue mixing together for another minute or so. Finally, add the corn and chopped cilantro to the mixture. Stir the mixture and continue cooking for about two more minutes. Do not overcook the squash. The squash should be cooked but al dente. Remove the squash and corn mixture from the skillet into a heat-resistant bowl. In a small bowl, add the Qué Mami Organics Red Enchilada Sauce and mix in the TABASCO® Sauce with a spoon. Once both sauces are combined, add half of this sauce to the squash and corn and mix well. Reserve the rest of the sauce for later. 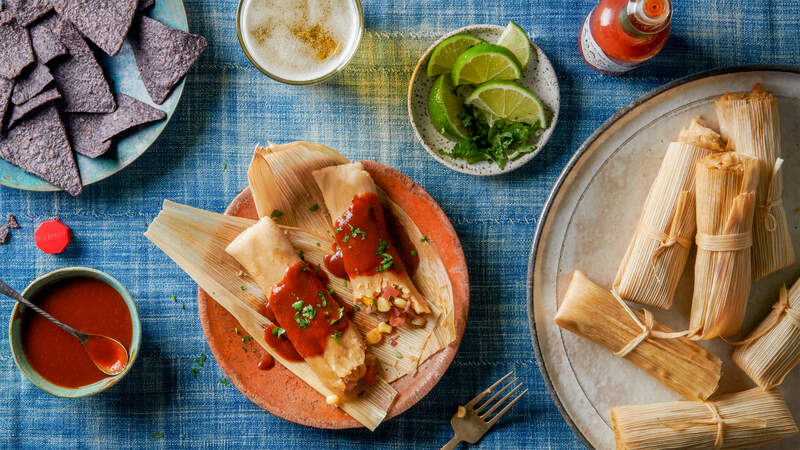 To assemble the tamales, take each corn husk and using a spoon or spatula, spread two tablespoons of the masa onto the wide end of the corn husk. The masa should extend across the corn husk, except for 1 inch on the sides, and about 3 inches from the narrower top. Next, scoop about 1 tablespoon of the squash and corn filling and place in the middle of the masa from top to bottom. Add 1 teaspoon of the reserved sauce over the filling and 1 piece of Monterey Jack cheese on top of the filling. Then, fold the right side of the corn husk over the filling, and seal with the masa on the side and top of the filling. Fold over the left side of the corn husk tightly around the other side and fold the narrow end of the corn husk up. You may cut strips from the corn husks to tie around each of the tamales for a more secure wrapping. Place the tamales in a steam pot with enough water to steam for about 40-45 minutes. The tamales should be placed into the pot standing tightly upright, filling-side up. You can secure the tamales with crumpled up aluminum foil so they don’t fall over in the pot. Cover the tamales with extra corn husks to trap in the steam, and place the lid on top of the pot. The tamales will be ready once the masa separates easily from the husk. If they need more time to cook, make sure to add more water to the pot before steaming longer.